0R59 1723 Loughborough Brush - Leicester L.I.P. 37038 tnt 37423 3S01 0922 Stowmarket D.G.L. 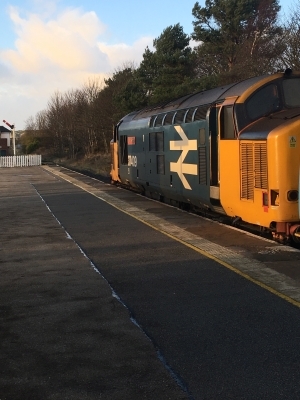 - Cromer - Diss Recp. - Great Yarmouth - Stowmarket D.G.L. 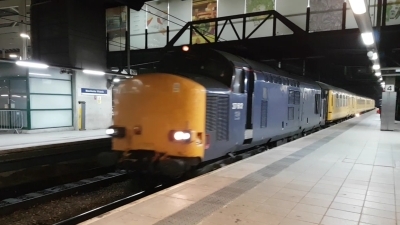 37116 tnt 37521 1Z23 0713 Bristol High Level Siding - Bedminster - Severn Tunnel Jn - Bedminster - Didcot Parkway - Leicester - Tyseley L.M.D. 37038 tnt 37423 6Z30 0828 Stowmarket D.G.L. - Norwich C.Pt. T.&R.S.M.D - Dereham U.K.F. 0M59 1502 York Holgate Siding (Gbrf) - Leicester L.I.P. 37038 tnt 37423 3S10 1934 Stowmarket D.G.L. - Shenfield - Southend Victoria - London Liverpool Street - Shenfield - Stratford - Braintree - Witham - Stowmarket D.G.L. 68034 + 37069 DIT 0K27 1443 Carlisle N.Y. - Crewe Bas Hall S.S.M. 37605 tnt 37606 3S30 2152 Stowmarket D.G.L. - Colchester Goods Loop - Clacton-on-sea - Colchester - Harwich International - Beccles - Stowmarket D.G.L. 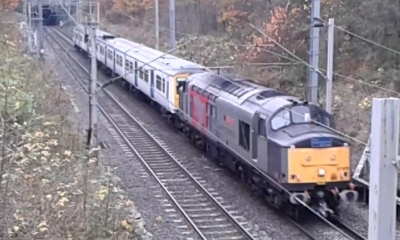 37611 5M59 1050 Eastleigh Arlington (Zg) - Leicester L.I.P. 37884 5Q50 0658 Crewe South Yard - Ilford E.M.U.D. 0M59 1520 Ilford E.M.U.D. - Leicester L.I.P. 3S50 1958 Stowmarket D.G.L. - Norwich T.C. 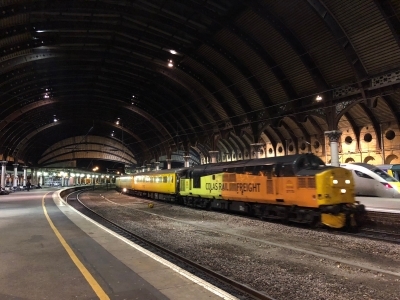 - Ely - Kings Lynn T.C. - Cambridge - Stowmarket D.G.L. 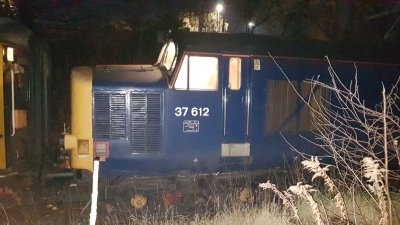 37116 tnt 37521 6C91 0500 Rice Lane - Crewe Bas Hall S.S.M. 37605 tnt 37606 3S10 1934 Stowmarket D.G.L. - Shenfield - Southend Victoria - London Liverpool Street - Shenfield - Stratford - Braintree - Witham - Stowmarket D.G.L. 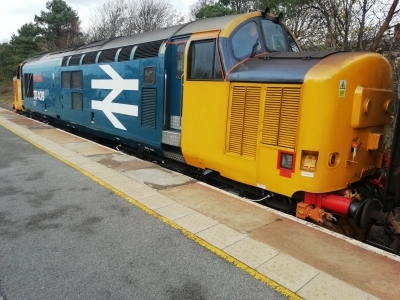 37884 0L50 1539 Leicester L.I.P. - Ilford E.M.U.D. 6C90 0700 Hooton - Crewe Bas Hall S.S.M. 37605 tnt 37606 3S10 2034 Stowmarket D.G.L. - Shenfield - Southend Victoria - Romford - Upminster - Shenfield - Braintree - Witham - Stowmarket D.G.L. 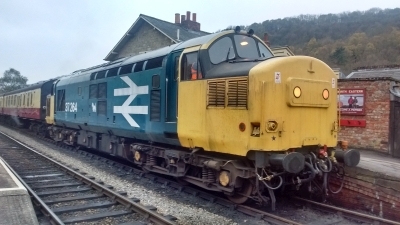 37610 3Z11 1400 Derby R.T.C. 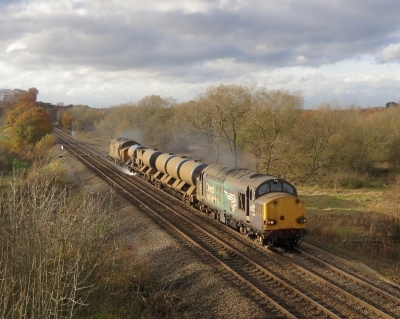 (Network Rail) - Ferme Park Recp. 37407 tnt 37423 3S10 1934 Stowmarket D.G.L. - Shenfield - Southend Victoria - Stratford - Shenfield - Romford - Upminster - Witham - Witham Down Loop - Stowmarket D.G.L. 37605 tnt 37606 3S60 0815 Stowmarket D.G.L. - Shenfield - Southend Victoria Dss - Clacton-on-sea - Stowmarket D.G.L. 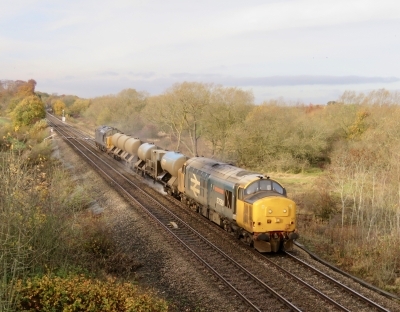 37607 0Z37 1700 Barrow Hill Colas Rail - Toton T.M.D. 37219 3Q71 2058 Colchester Reception Line - Cambridge - Lowestoft - Norwich T.C. 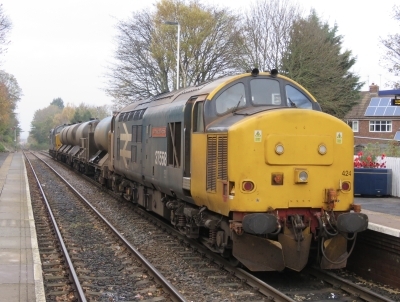 37601 0H72 0832 Leicester L.I.P. - Wembley H.S. 0M59 1300 Carlisle - Leicester L.I.P. 37038 tnt 37405 3S01 0922 Stowmarket D.G.L. 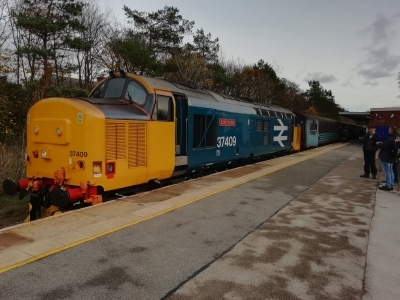 - Cromer - Diss Recp. - Great Yarmouth - Stowmarket D.G.L. 37038 tnt 37423 3S30 2101 Stowmarket D.G.L. - Clacton-on-sea - Colchester - Harwich International - Lowestoft - Stowmarket D.G.L. 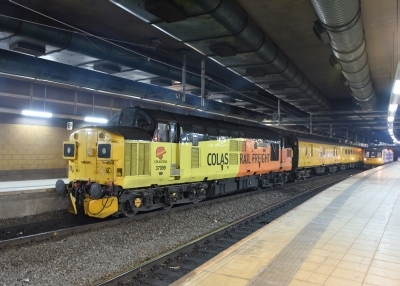 37800 0M59 1710 Doncaster Robert Rds Shed - Leicester L.I.P. 37038 tnt 37405 3S10 1934 Stowmarket D.G.L. - Shenfield - Southend Victoria - London Liverpool Street - Shenfield - Stratford - Stowmarket D.G.L. 37219 3Q67 2128 Cambridge T.&R.S.M.D. - Norwich - Cromer - Sheringham - Cromer - Norwich T.C. 37405 tnt 37407 6Z30 0828 Stowmarket D.G.L. - Norwich C.Pt. T.&R.S.M.D - Dereham U.K.F. 37423 0Z30 0650 Crewe Gresty Bridge (Drs) - Stowmarket D.G.L. 37605 tnt 37606 3S30 2101 Stowmarket D.G.L. - Clacton-on-sea - Colchester - Harwich International - Lowestoft - Stowmarket D.G.L. 3Z82 1943 Derby R.T.C. 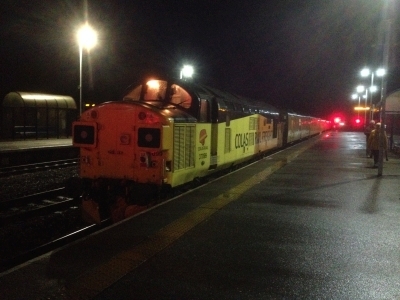 (Network Rail) - Bangor C.S. 5C40 1920 Workington - Barrow C.S. 37405 tnt 37407 3S01 0922 Stowmarket D.G.L. - Cromer - Diss Recp. - Great Yarmouth - Stowmarket D.G.L. 3S30 2101 Stowmarket D.G.L. - Clacton-on-sea - Colchester - Harwich International - Lowestoft - Stowmarket D.G.L. 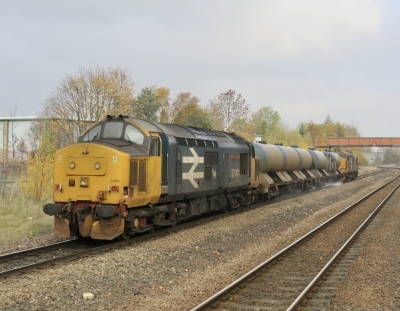 68016 & 37422 DIT 6C18 0252 Crewe Bas Hall S.S.M. - Carlisle N.Y.
3S10 1934 Stowmarket D.G.L. - Shenfield - Southend Victoria - London Liverpool Street - Shenfield - Stratford - Stowmarket D.G.L. 37611 0L50 1104 Wembley H.S. - Ilford E.M.U.D. 0M72 1505 Ilford E.M.U.D. - Wembley H.S. 37716 5V91 1945 Norwich C.Pt. T.&R.S.M.D - Ilford E.M.U.D. 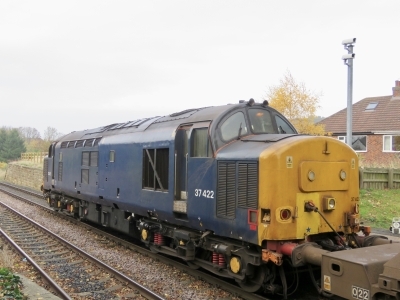 37405 tnt 37407 3S30 2149 Stowmarket D.G.L. - Colchester - Clacton-on-sea - Colchester - Harwich International - Lowestoft - Stowmarket D.G.L. 37605 tnt 37606 3S60 0837 Stowmarket D.G.L. - Chelmsford D.G.L - Clacton-on-sea - Colchester - Norwich T.C. - Stowmarket D.G.L. 37405 tnt 37407 3S01 0922 Stowmarket D.G.L. - Cromer - Norwich C.Pt. T.&R.S.M.D - Great Yarmouth - Stowmarket D.G.L. 37605 tnt 37606 3S60 0814 Stowmarket D.G.L. - Harwich International - Southend Victoria Dss - Clacton-on-Sea - Stowmarket D.G.L. 37611 0L50 0655 Wembley H.S. - Ilford E.M.U.D. 5Q50 1552 New Cross Gate C.S.D - Ilford E.M.U.D. 1723 Loughborough Brush - Leicester L.I.P. 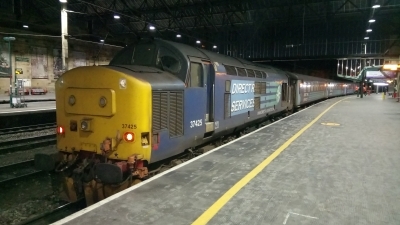 37884 0515 Leicester L.I.P. - Ilford E.M.U.D., started at Wembley H.S. 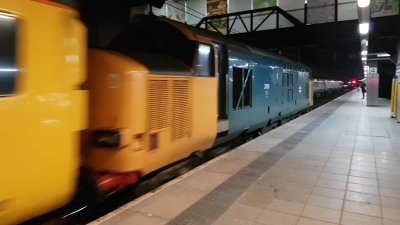 37219 3Q89 2257 Crewe C.S. (L&NWR Site) - Liverpool Lime Street - Southport - Liverpool Lime Street - Crewe C.S. (L&NWR Site). 37405 tnt 37407 3S60 0814 Stowmarket D.G.L. - Shenfield - Southend Victoria Dss - Clacton-on-sea - Stowmarket D.G.L. 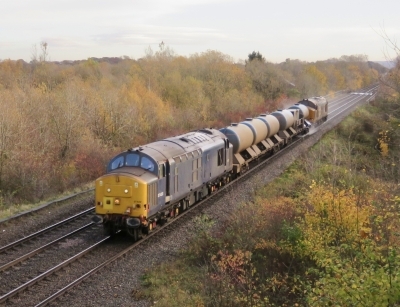 37800 0R59 0711 Masboro Booths P S - Leicester L.I.P. 37884 0H72 1800 Crewe South Yard - Wembley H.S. 37254 3Z19 1400 Derby R.T.C. (Network Rail) - Hither Green P.A.D. 3Q19 2006 Hither Green P.A.D. - Tonbridge - Redhill - Eastbourne - Brighton - Seaford - Wivelsfield - Lewes - Redhill - Tonbridge P O Sidings - Hither Green P.A.D. 37605 tnt 37606 3S60 0814 Stowmarket D.G.L. - Shenfield - Southend Victoria Dss - Shenfield, failed then dirverted to Ilford E.M.U.D. 37605 0S60 1508 Ilford E.M.U.D. - Stowmarket D.G.L. 37405 tnt 37407 3S60 0814 Stowmarket D.G.L. - Harwich International - Southend Victoria Dss - Clacton-on-Sea - Stowmarket D.G.L. 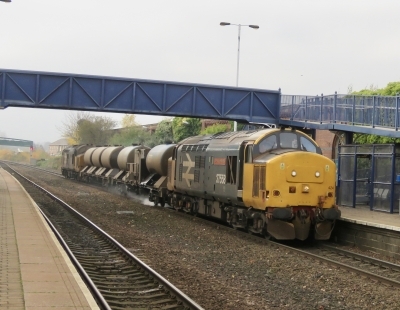 37605 tnt 37606 + 57007 6Z30 0828 Stowmarket D.G.L. - Norwich C.Pt. T.&R.S.M.D - Dereham U.K.F. 37605 tnt 37606 3S10 1934 Stowmarket D.G.L. - Shenfield - Southend Victoria - London Liverpool Street - Shenfield - Romford - Upminster - Stratford - Braintree - Witham - Stowmarket D.G.L. 37038 tnt 57002 3S50 1935 Stowmarket D.G.L. - Ely - Norwich - Ely - Downham Market - Cambridge - Stowmarket D.G.L. 37099 6C90 0500 Liverpool South Pw Ll - Crewe Bas Hall S.S.M. 37405 tnt 37407 3S60 0837 Stowmarket D.G.L. - Shenfield - Clacton-on-sea - Colchester - Norwich T.C. - Stowmarket D.G.L. 37800 0M59 0918 Wembley H.S. - Leicester L.I.P. 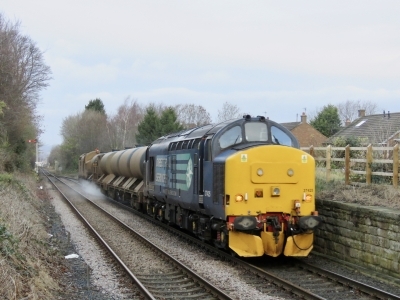 68018 + 37069 6C02 0419 Crewe Bas Hall S.S.N. 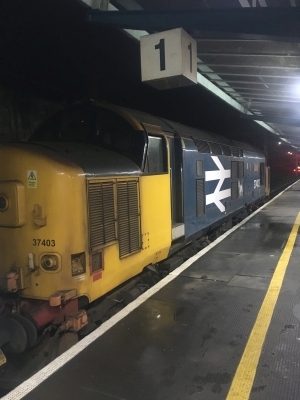 - Carlisle N.Y.
37219 3Q52 2245 Bristol High Level Siding - Liskeard - Looe - Newquay - Exeter Riverside N.Y.
0R61 1757 Old Dalby - Leicester L.I.P. 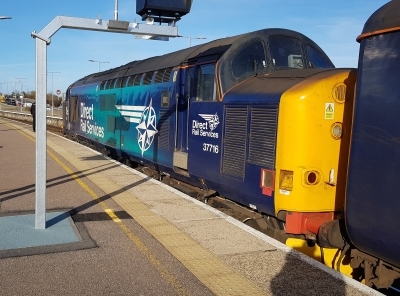 37607 tnt 37612 1Q99 1644 Cambridge Recp 1-3 - Kings Lynn - Ipswich - Norwich - Colchester Goods Loop - Felixstowe Creek R.S - Mistley - March Down R.S. 37800 5Q50 0658 Crewe South Yard - Ilford E.M.U.D. 0M59 1520 Ilford E.M.U.D. - Wembley H.S. 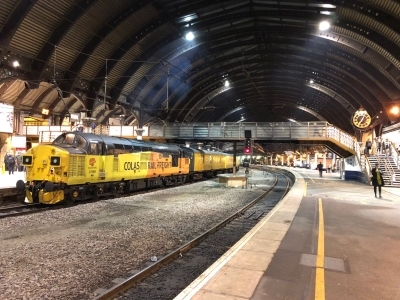 0Z39 1525 York - Heaton T&R.S.M.D. 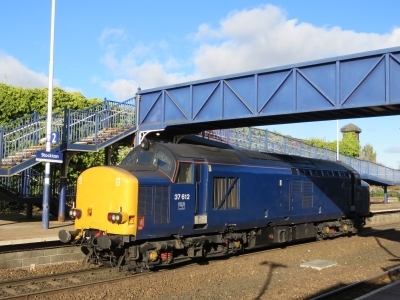 37601 0H72 0708 Leicester L.I.P. - Wembley H.S. 37605 tnt 37606 3S01 0922 Stowmarket D.G.L. - Cromer - Norwich C.Pt. T.&R.S.M.D - Acle - Stowmarket D.G.L. 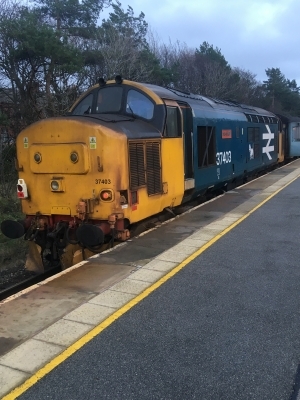 37610 3Q36 2127 Inverness T.M.D. - Kyle Of Lochalsh - Inverness T.M.D. 37800 0L50 1400 Leicester L.I.P. - Ilford E.M.U.D. 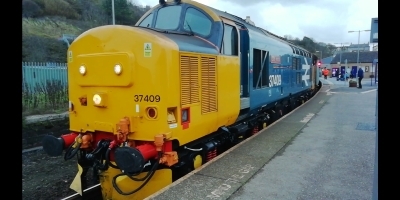 37405 tnt 37605 1340 Ilford E.M.U.D. - Stowmarket D.G.L. 37407 tnt 37606 3S01 0922 Stowmarket D.G.L. - Cromer - Norwich C.Pt. T.&R.S.M.D - Great Yarmouth - Stowmarket D.G.L. 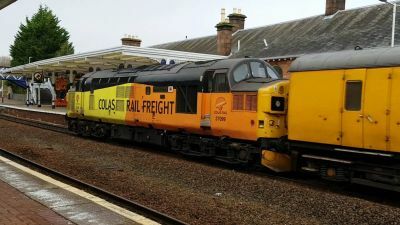 3Q40 2014 Mossend Down Yard - Paisley Gilmour Street - Inverness T.M.D. 0R59 2033 Loughborough Brush - Leicester L.I.P. 37884 0L53 0655 Wembley H.S. - Ilford E.M.U.D. 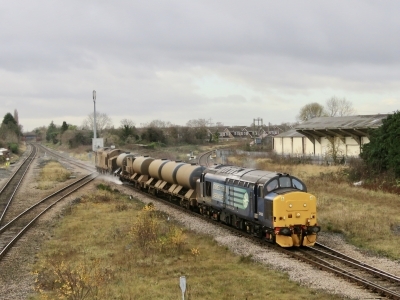 0M59 1545 Newport Docks - Leicester L.I.P. 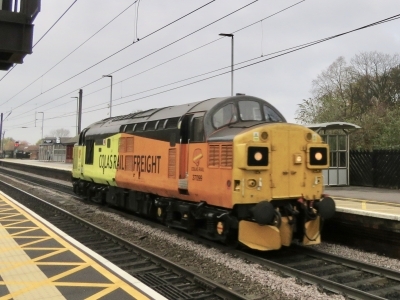 37405 tnt 37605 3S01 0922 Stowmarket D.G.L. - Cromer - Norwich C.Pt. T.&R.S.M.D - Great Yarmouth - Stowmarket D.G.L. 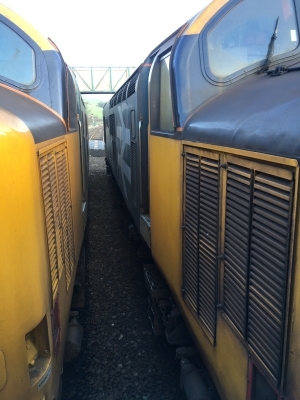 5J94 2300 Lowestoft - Norwich Stn C.S.D. 6Z96 1014 Whitemoor Yard L.D.C Gbrf - Westbury Down T.C. 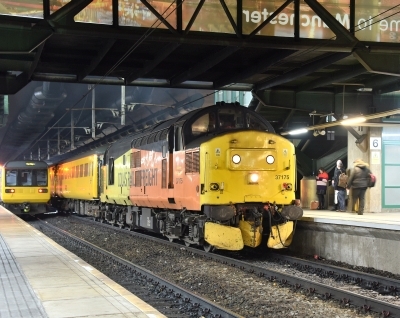 37601 + 37611 0H72 0430 Leicester L.I.P. - Wembley H.S. 37601 0M60 1030 Wembley H.S. - Leicester L.I.P. 37800 0310 Wembley H.S. - Ilford E.M.U.D. 0J72 1620 Kingsbury Sdgs - Wembley H.S. 5Q42 1355 Long Marston - Crewe C.S. 2045 Crewe C.S. - Wembley H.S. 97303 + 97304 6C70 1500 Dovey Junction - Crewe Bas Hall S.S.M. 97303 tnt 97304 0C70 1856 Coleham Isu (Ce) to Crewe Bas Hall S.S.M. 37116 3Z03 1018 Exeter Riverside N.Y. - Exeter St Davids Fp - Exeter Riverside N.Y.
37405 tnt 37606 3S60 0901 Stowmarket D.G.L. - Stowmarket D.G.L. 3S30 2152 Stowmarket D.G.L. 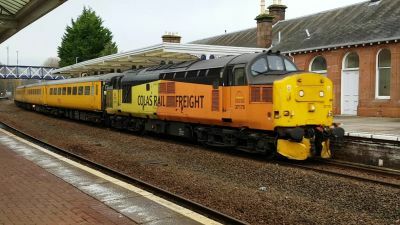 - Colchester Goods Loop - Clacton-on-sea - Colchester - Harwich International - Lowestoft - Stowmarket D.G.L. 37611 0M59 1900 Hull K G V Dock B Quay Sdg - Leicester L.I.P. 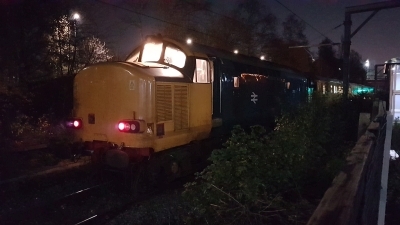 37884 0R99 1315 Doncaster West Yard - Leicester L.I.P. 37099 tnt 37175 1Z23 0937 Bristol High Level Siding - Didcot Parkway - Leicester - Tyseley L.M.D. 37116 3Q07 2053 Exeter Riverside N.Y. - Yeovil Pen Mill - Yeovil Junction - Salisbury - Exeter Riverside N.Y.
37405 tnt 37606 6Z30 0828 Stowmarket D.G.L. - Norwich C.Pt. T.&R.S.M.D - Dereham U.K.F. 37602 tnt 57003 3S01 0922 Stowmarket D.G.L. - Cromer - Norwich C.Pt. T.&R.S.M.D - Great Yarmouth - Stowmarket D.G.L.